"These twice-baked sweet potatoes are savory and perfect for a weekend breakfast or weeknight dinner. For a vegetarian version, skip chorizo and add mushroom or zucchini. Enjoy these boats with Mexican crema, lime juice, and extra cilantro." Coat sweet potatoes with olive oil and season with salt; place on the prepared baking sheet. Bake in the preheated oven until sweet potatoes are tender, about 1 hour. Cool until easily handled. Cook and stir chorizo, onion, poblano pepper, and garlic in a skillet over medium-high heat until chorizo is cooked through, about 10 minutes. Remove skillet from heat and stir cilantro into chorizo mixture. Slice tops of cooled sweet potatoes horizontally and scoop out some of the flesh, creating "boats" with the peels and remaining flesh. Spoon chorizo mixture into "boats", forming a well in the middle. Crack 1 egg into each well and top with pepperjack cheese. Place boats on the baking sheet. Bake in the oven until egg whites are set and cheese is melted, about 15 minutes. 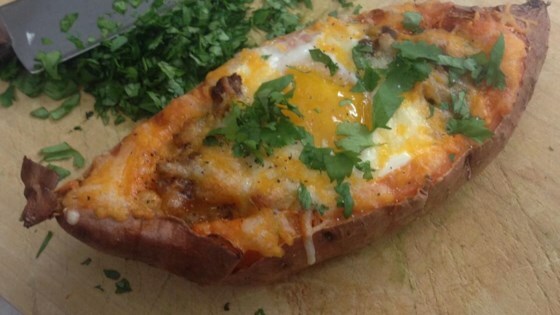 Enjoy these stuffed sweet potatoes for brunch, lunch, or breakfast-for-dinner. Nutrition data for this recipe includes the full amount of sweet potato. The actual amount consumed will vary. I used left over taco meat instead of chorizo. Tasted good! I didn't make any changes. I found the recipe to be lacking in flavor.